We're all familiar with the literary trope about bright, happy homeowners who celebrate finding a deeply-discounted house until said house inevitably turns out to be haunted. "Big deal," some of us scoff, "I'd still buy a discounted house, even if it's supposedly haunted." Now's your chance to prove it, Braveheart. 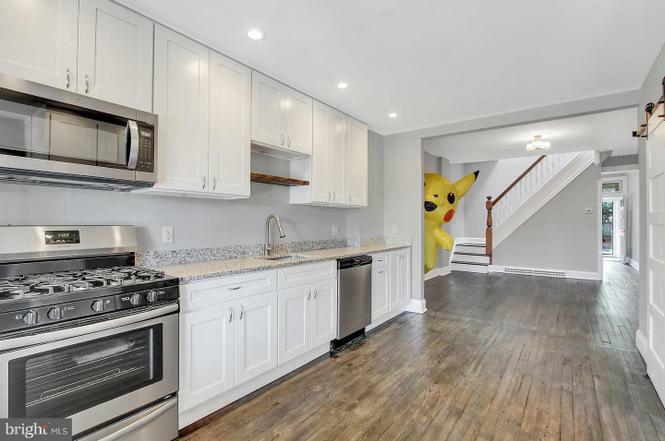 A realtor in Baltimore recently listed a 3-bedroom 1.5-bathroom house that's clearly haunted by a Pikachu with human calves and feet. 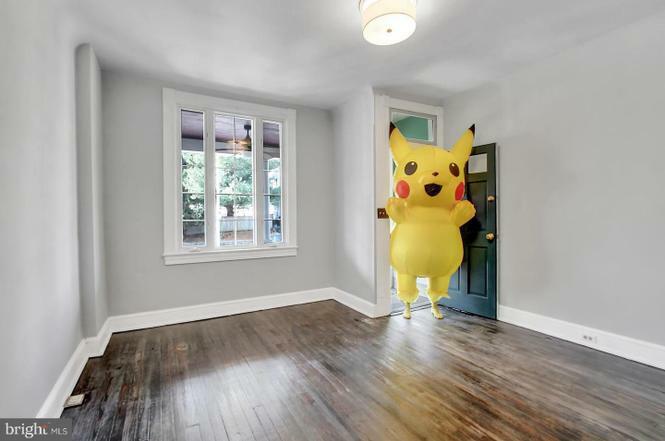 The robust image gallery showing off the house's interior and exterior contains plenty of photos with Pikachu front-and-center. Or off to the side. Or peeking through the window or around the corner like some demented Five Nights at Freddy's animatronic. Looking at these photos, I don't think this monstrously huge Pikachu yokai has much practice in not being creepy as hell. Know what, though? For every Candle Cove-esque "I seeeee yoooooooou!" picture, there's a picture of Pikachu sweeping, or showing off the nice hardwood flooring, or demonstrating how the house's appliances are still in good working order. He clearly loves this house, and he wants you to love it, too. Heck, you're looking at $324,900 USD for a not-terrible part of Baltimore (though the house still contains a built-in safe for your convenience and the backyard's rusty fencing makes me think of a prison yard). That's not a bad price for a house in this economy, even if that house is possessed by a Pikachu with man-calves. Pokemon had an excellent 2018 thanks to the success of Pokemon Let's Go, which made our Top 20 Games of 2018 list. It's also on-track for a cool 2019, since this is the year we're supposed to see Gen 8 hit the Nintendo Switch. In other words, this isn't a bad time to make friends with a haunted house Pikachu. For more Pokemon Let's Go coverage, you can check out our complete Pokemon Let's Go beginner's guide for an introduction to the game. There's also our page on how to get Shiny Pokemon in Pokemon Let's Go, our Pokemon Let's Go transfer guides, and our Pokemon Let's Go evolution levels guide, among others. Tagged with Game Freak,	News,	Pokemon,	Role Playing Games,	Switch.